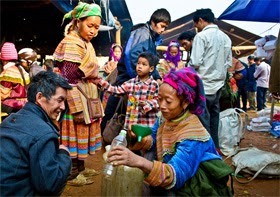 Picked up at Lao cai Railway Station early in the morning by our bus then transfer to Bac Ha round and having breakfast. At 9.30am we start trek to the Ban Pho village, there're many beautiful sights in this area so that tourists can take pictures, enjoy the beauty of terraces fields. 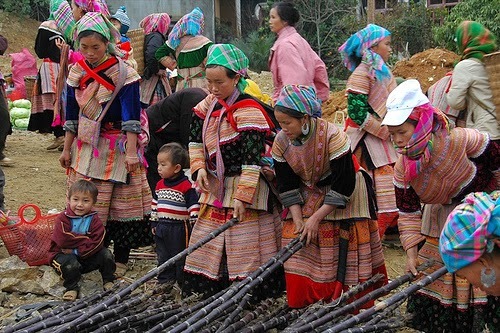 Besides, you can visit villagers’ houses to discover their tradition and culture. Going through H'Mong and Nung's villages, you will have to climb up to the height of 1200 meters, the weather here's very cold and dry. At noon, time for relaxing and having lunch in a place in where there're lots of grasses fields which used to be place for camping. From this place, you can see valleys, the Sa Mu forest and hidden villages in the mist. After having lunch, you will go through the hillsides down to Na Lo. We stay overnight with Nung's family and have our dinner here. Approx: 4 hours trekking 18 km, 1 hour lunch, 3 villages. Approx: 3 hours trekking, 1hour lunch. Arrive Hanoi in the early morning, back to your hotel by yourself. End of all services here.